I've been doing some flying and have been enjoying the finest food (and a gross Continental cheese burger) United Airlines has to offer domestic first class passengers. Here are some reviews of United's food service. 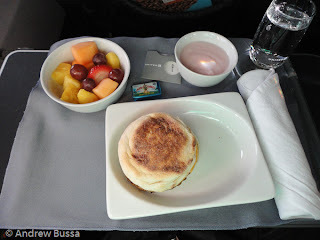 Meals are served on flights 700 to 2,299 miles long (approximately 2 – 5 hours). On shorter flights, flight attendants just pass around the snack basket with chips and Clif bars. Egg McMuffin, fruit, and some yogurt on a 737 ride to Houston. The Egg McMuffin creation is really good. A warm cinnamon bun or croissant follows after everyone is served. The cinnamon bun is great, but really sticky, so keep a napkin handy. Shrimp salad and soup! Both rock. This is United's most consistent meal and a favorite. It is very flavorful and filling. The soup option was a great seafood with spice creation. I could have that soup every flight and not tire of it. The cookie was oatmeal raisin, too healthy to be fun. The cream of mushroom soup doesn't look appealing, but it tastes great. United's soup guy is on a roll. The warm wrap was a good south-west chicken thing, filling and comforting item. United's warm meal options can be hit or miss. I also got a chocolate chip cookie, fun and yum.